To be honest, the only reason I was so excited about this book I included it on my second list of most anticipated picture books of 2012 was because of the chopsticks. It is so rare to find this object which plays such a huge part in our life in Asia in Canadian picture books. Or so I thought! Very soon after I published this list there I read The Stone Hatchlings, which was not only adorable but also included chopsticks very innocuously as materials for a nest. So there are at least two Canadian picture books that include these pieces of cutlery out there! Maggie is trying so hard to master the use of her chopsticks. She just doesn't seem to be able to do it the same way as everyone else. Her grandmother's chopsticks are old, her brother's grip strong, and her sister's graceful. Maggie can't mimic the others, and she feels discouraged from their words. But Father is there to cheer her on, and with his encouragement she is able to find her own way. The way the chopsticks mimic their holders is one of the best things about this book. Woo's metaphors give us snapshots of the characters in Maggie's life and how they treat her. Isabelle Malenfant's illustrations are an excellent match for Woo's text. I love how her characters are so expressive with the eyes rather than just their mouths. This is a very Asian aesthetic, and I've heard teachers tell children that it is most polite to keep your mouth neutral and express yourself with your eyes (see, Tyre isn't the first to smize!). Of course I love the rosy cheeks, that's my weakness. Malengant's use of rich complementary colours makes this book a joy to flip through. I hope more of the books she has illustrated make their way into English. 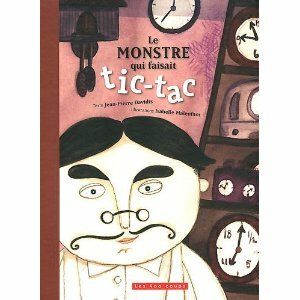 I'm especially interested in Le Monstre Qui Faisait Tic-Tac, and I think my son would love it. This is the ninth book I have reviewed for the Sixth Canadian Book Challenge. The illustrations look really cute! I have no idea what recent books have come out in Australia recently but you have inspired me to look into them some more. I tend to go towards authors I knew when I was a child! Your post made me laugh when you said "It is so rare to find this object which plays such a huge part in our life in Asia in Canadian picture books." My daughter had to give a demonstration lesson for an ESL job and because she had just come home from 2 years in China, her lesson was how to use chopsticks (she gave everyone chopstick and M&Ms to use) It went over very well and she got the job. You're right - it is an important object in Asian life. I'm gonna post it up on my Facebook page!